[Austen Ivereigh] From some of today’s headlines about Pope Francis yesterday being handed a poster calling for dialogue between the UK and Argentina over the Falklands, you would imagine that he was urging a re-invasion of the islands. 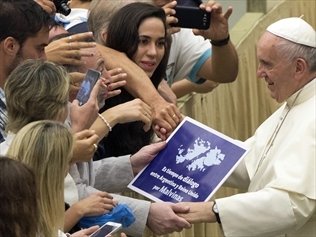 The Telegraph is the most mischievous: “Pope Francis poses with ‘Dialogue for Malvinas’ sign” is its headline, although the Buenos Aires Herald — “Pope joins dialogue call for Malvinas” — comes a close second. “Posing” means wanting to be seen with it. Far more accurate is Bloomberg, which said he was “tricked to pose” with the sign. The BBC and the Guardian say only that he was photographed holding the sign, with the Guardian adding that it was “unclear” if the Pope was making an “intentional statement”. But of course, he wasn’t making a statement at all. He was handed a small poster — a quite normal occurrence at a General Audience, when popes are constantly handed things — and was totally unaware of what was written on it. “The Holy Father did not even realize he had this object in his hands,” the Holy See Press Office made clear to Bloomberg. “He has discovered this just after seeing the photograph”. The campaigners who gave the Pope the poster say that’s not true. Gustavo Hoyo, its leader, told Clarín that he explained to Francis what it was about before he gave it to him. But that still doesn’t imply endorsement. The Pope usually takes whatever he is given, because to refuse what people want to give him sends another kind of message. The Holy See refuses to be drawn into the dispute over the islands, a policy Pope Francis entirely supports — despite the efforts of some to align him with Argentina’s claim. If ever that changed, he would hardly use a poster in a crowd to alter his policy.